HOW TO REGAIN YOUR ADVERTISING DOLLARS WHETHER YOU WORK FROM HOME OR ARE A BIG CORPORATION. 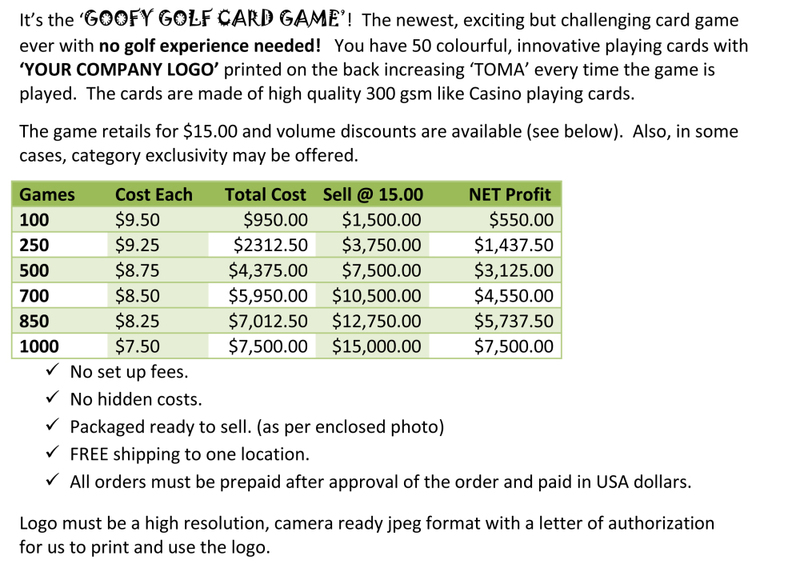 You can customize the back of the GOOFY GOLF CARD GAME with your business logo (50 cards). Sell the games and recover your money or give them away like a business card either way you win. Every time the game is played subliminal advertising is working for you. Top of mind awareness is the goal to help you succeed. No one throws a card game away like they do with a newspaper or magazine, colour flyer or other disposable adds that cost you a lot of money. This is an investment in long-term sustainable advertising.